It seems like only yesterday when I took Mom, sis and bestie to Nobu for afternoon tea. Perhaps it’s time for a revisit since Nobu has just refreshed and updated its Sky High Tea menu. Especially now, with new Pastry Chef Jackie Teo sweetening the experience with his delicate and inventive creations. The young chef’s pastry prowess shines through in the Premium Menu (RM138 per person). Some of the irresistible treats we sampled were playful whilst others artfully blended French-Japanese influences. Teo’s youthful flair was evident from the offering of Caramel Mousse with Miso & Butterscotch Glaze. We loved the mini dramatic touch of having hot sakura sauce (sakura tea, milk and cream) poured over the chocolate disc with an edible dab of gold on top to reveal the contents inside the cup. His attention to detail also emerged in the tiny sugared white flowers perched atop the flawlessly smooth domes of Chocolate Miso with Chocolate Sponge. Our palate welcomed the dessert’s lush savoury-sweet flavour combination. Crisp and soft textures tangoed on our tastebuds when we bit into the Yuzu Mango Mille Feuille, sandwiched with mango cream and tiny dollops of cinnamon curd. For the Matcha Cake with Adzuki Bean Paste & Crispy Tuile, the chef paired it with honey as sauce for the mini green tea cakes, to lend moistness. Apart from the dainty portions, we enjoyed the muted sweetness of each dessert thus ensuring no undesirable cloying aftertaste. 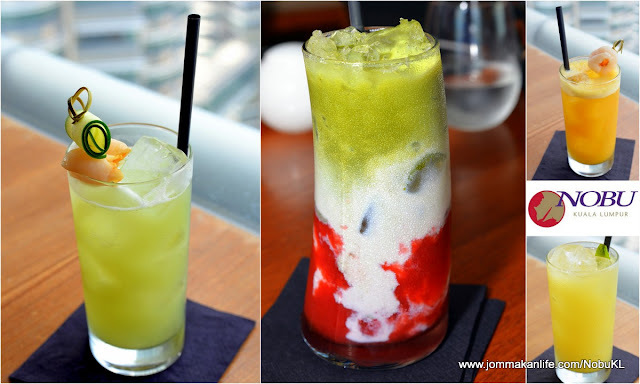 Nobu KL is also known for its range of mixology tipples. Nothing adds further refreshment to sultry afternoons than the well shaken and stirred house Mocktails (RM28 each). Recommended choices include Lychee Passion (pineapple juice combined with passionfruit & lychee), Calamansi Shisho (calamansi lime juice jazzed up with shiso and ginger ale) and Yuzu Pina Cooler (pineapple and yuzu juice infused with ginger and ginger ale). A somewhat off-beat drink is Strawberry Matcha (RM26) – an interesting, tri-coloured concoction of soya milk layered with freshly blended strawberries and green tea. It sounded kinda whacky but surprisingly, the cold drink proved more than agreeable. On the savoury front, a joyful riot of vibrant accents and differing textures tickled our tastebuds. While a classic temptation of Smoked Salmon with Sour Cream Roll hardly rocked the culinary showboat, newer nibbles of Snow Crab with Ricotta Aioli and Lobster Tacos with Tomato Salsa managed to up the ante for the touted premium afternoon tea experience. These left us craving for more so I reckon that was a good thing. I also wanted more of those wickedly delish Toro Tartar on Pumpkin Biscuits. Diminutive in size but chockful of bright, voluptuous nuances and nice textural contrasts, they were delightfully sumptuous. Although I’m not big on fried softshell crab, I was charmed by the on-point Softshell Crab with Watermelon Ponzu as it hit all the right flavour and texture notes. Such tastiness was complemented by delectably hearty Wagyu Gyoza dumplings. Need more dishes to supplement the tea morsels? Then peruse the menu for samplings of Nobu KL’s house specialities such as Padrón Pepper with Shimeiji (RM28). Known as shishito pepper in Japan, the mild green pepper came slightly scorched and blistered, teamed with earthy shimeiji mushrooms and a sprinkling of black sesame seeds – a sublime appetiser to tease the discerning tastebuds. A fun way to wrap up your Sky High Tea outing should include a serving of Coffee Jelly (RM20), a light, splendid coffee jelly and cream treat. Just the presentation alone should pique your Instagram interest, trust me. Nobu KL’s Signature High Tea is priced at RM93 per person while the Premium Menu is priced at RM138 per person, inclusive of complimentary green tea. For reservations, call Nobu KL, tel: 03-2164 5084.